UPDATED: Abigail Adams: Slave Owner or Not? Abigail Adams was very important to history. She was one of the first people who was against slavery from the very beginning. She and her husband, John Adams, did not own slaves. They were outspokenly against slavery. In a letter she wrote to John Adams, she explained that “Unsearchable are the ways of Heaven who permitteth Evil to befall a city and a people by those very hands who were by them constituded the Gaurdians and protecters of them. We have done Evil or our Enimies would be at peace with us. The Sin of Slavery as well as many others is not washed away.” By using the words “Sin of Slavery,” she is showing just how much she was against slavery. She also wondered if disease and war were God’s way of punishing America for committing the acts of slavery. Letter from Abigail Adams to John Adams on September 14, 1774. What some people do not know is that Abigail was not always surrounded by people who were against slavery. Her husband was against it, as well as her cousin, Samuel Adams. However, her father owned slaves so she grew up around slavery. I believe that it was her relationship with John Adams that made her opposition against slavery so strong. Abigail always tried to abolish slavery and emancipate the slaves. She was always writing letters to John about these issues, hoping that he would voice these opinions while in Philadelphia; however, a majority of the members at the meetings in Philadelphia owned slaves so he could not accomplish as much as his wife hoped he would. Abigail and her granddaughter oversee servant hanging laundry to dry. As previously stated, both Abigail and John Adams never owned slaves. George and Martha Washington brought over slaves form Mount Vernon during George’s time of presidency. Abigail and John never had slaves in the President’s House. They were that opposed to slavery. They would hire a few staff members, but never slaves. The Adams family was known for being very outspoken and against slavery. At the time, most people in politics either owned slaves or were against slavery, yet still owned slaves. The Adams family were only a few of the people who were against slavery and did not own slaves. Abigail Adams did as best she could do to try and stop slavery. Like I said before, she was a woman. She didn’t have a voice. But with the little voice she did have, she made sure to use it. 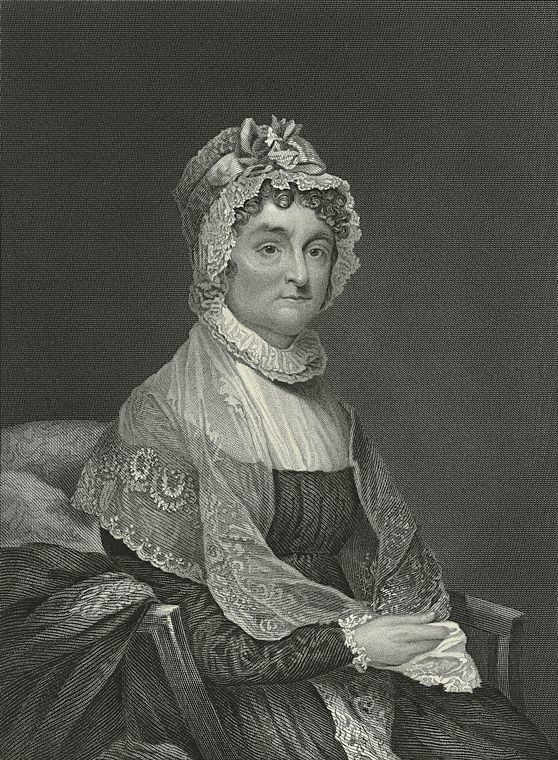 “Abigail Adams to John Adams, 25 October 1775,” Founders Online, National Archives (http://founders.archives.gov/documents/Adams/04-01-02-0206 [last update: 2015-02-20]). Source: The Adams Papers, Adams Family Correspondence, vol. 1, December 1761 – May 1776, ed. Lyman H. Butterfield. Cambridge, MA: Harvard University Press, 1963, pp. 312–314. Bober, Natalie S. Abigail Adams: Witness to a Revolution. New York: Simon and Schuster Children’s Division, 1998. Google Books. Google. Web. 5 Mar. 2015. Hubbard-Brown, Janet. Abigail Adams: First Lady. New York: Infobase Publication, 2009. Google Books. Google. Web. 5 Mar. 2015. Letter From Abigail Adams to John Adams September 14, 1774. N.d. Massachusetts Historical Museum. Vassar. Web. 5 Mar. 2015. 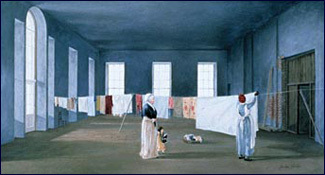 A Mid-20th Century Depiction of Abigail Adams Overseeing the Hanging of Her Family’s Wet Laundry in the East Room to Dry. N.d. White House Historical Association. National First Ladies’ Library. Web. 5 Mar. 2015. Sutcliffe, Janet. Abigail Adams. Minneapolis: Learners Publications, 2006. Google Books. Google. Web. 5 Mar. 2015.